Digitally printed event tickets can be fully personalised, to include the ticket holders name and photograph if necessary. From just a few tickets to many thousands we are equipped to make your ordering simple. Our bespoke software allows all the variable data for a series of events to be generated from a mouse click. 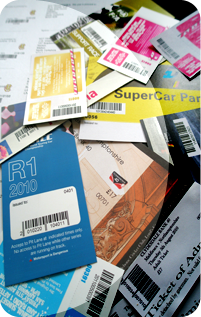 Each ticket can be uniquely barcoded allowing fast verification of valid tickets. Tickets can be scanned at point of sale and at the point of entry to the venue. The data we use to print the tickets can be made available for bulk import into your applications.